Moses Rodriguez, M.D., is a nationally recognized multiple sclerosis expert. He holds the academic rank of Professor of Neurology and Immunology and holds the Mildred A. and Henry Uihlein II Professorship in Medical Research. 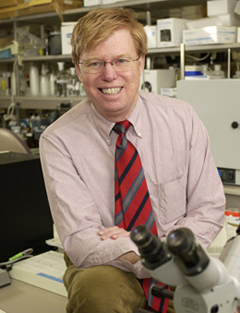 He recently received the highest award at Mayo Clinic – the Distinguished Investigator Award. He earned his B.A. degree in medical sciences and M.D. degree at Northwestern University. After residency in internal medicine and a residency in neurology at Mayo Graduate School of Medicine, he served as a trainee at the National Institutes of Health and completed fellowships in neuropathology at the University of California, San Diego, and at Scripps Research Institute. Dr. Rodriguez has made significant contributions to both the clinical and basic science aspects of multiple sclerosis. His research has focused on developing methods to reverse the deterioration of the central nervous system in multiple sclerosis, a debilitation by the destruction of the multi-layered sheath that surrounds nerve fibers called myelin. Dr. Rodriguez was the first to demonstrate conclusively that plasma exchange is effective in patients with severe, devastating attacks of multiple sclerosis. He is also a member of a Mayo Clinic research team that identified the human-produced hormone Interleukin-6 that may prolong neuron (brain cell) life. Dr. Rodriguez holds 14 U.S. patents related to his fundamental medical discoveries and has authored more than 400 peer reviewed papers. Currently the principal investigator of five grants, he directs a prestigious National MS Society Center of Excellence and the Mayo Center for Multiple Sclerosis and Central Nervous System Demyelinating Diseases Research and Therapeutics. A talented musician, Dr. Rodriguez is co-director of Trombones Anonymous, a regional trombone choir for which he has written over 250 original arrangements. He enjoys bass fishing and camping with his family in the Boundary Waters Canoe Area in Northern Minnesota. Dr. Moses Rodriguez's research is focused on determining the mechanisms of demyelination and remyelination in diseases such as Human Multiple Sclerosis. Using Eye-Tracking as Support for the TEACCH Program and Two Teenagers with Autism-Spectrum Disorders..